This post is specially for ‘Happy Laughs’, ‘House by the Water’ and the other overseas bloggers whose projects I follow and who are following mine. Reading about all the wonderful house builds and renovations taking place in Australia and the States, I’ve become aware of the different vocabularies we use sometimes and thought it might be fun to start a building ‘glossary’. For my part, I have learned a few things from House by the Water. Early on, I became a little confused by the emphasis Jo was placing on her kitchen benches. In South Africa we use the word ‘bench’ to describe something we sit on. A bench can be an elongated stool, with no backrest and no upholstery, that can seat several people at once. 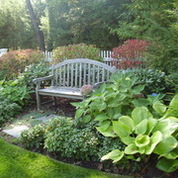 It can also be a garden bench which might have a wooden slatted back rest or a wrought iron one. The only time ‘bench’ is used to describe a work surface is in terms of a ‘work bench’ in a wood working studio. It is never used to describe the tops of kitchen cabinets. We call those ‘counter tops.’ Until reading one of the earlier posts in ‘House by the Water’ I had never heard the word bench used for work surfaces in a kitchen. Once I’d figured that out, I could easily understand why Johanne was giving the matter so much thought. In a more recent post, I learned from ‘House by the Water’ that to have a ‘sticky beak’ was to have a look around a place, and not, as I first thought, to pop in for a casual cup of tea or coffee and something sweet and ‘sticky’ to eat…. In my post about Fountains and Fireplaces, I mentioned that we’d found an interesting fireplace manufacturer out in the ‘veld’ and ‘House by the Water’ responded that she was off to look up the word ‘veld’. Veld refers to open fields and uncultivated farmland. I think in Australia you’d call it the ‘bush’. And I suspect in the States you might say ‘the country’. We also use the expression ‘the bush’ in South Africa but more specifically when we’re referring to an area where there are wild animals as opposed to farm ones. Often, when planning a holiday in the Kruger National Park or a similar game reserve, we might say we’re going to ‘the bush’. The word ‘veld’ is an Afrikaans one, derived from Dutch which was spoken by many of the earliest European settlers in this country. A scullery is a small kitchen or room at the back of a house used for washing dishes and other dirty household work. It’s origin is late Middle English (denoting the department of a household concerned with kitchen utensils): from Old French esculerie. So it’s a dishwashing space, separate from the laundry which is specifically for washing clothes and household linens. 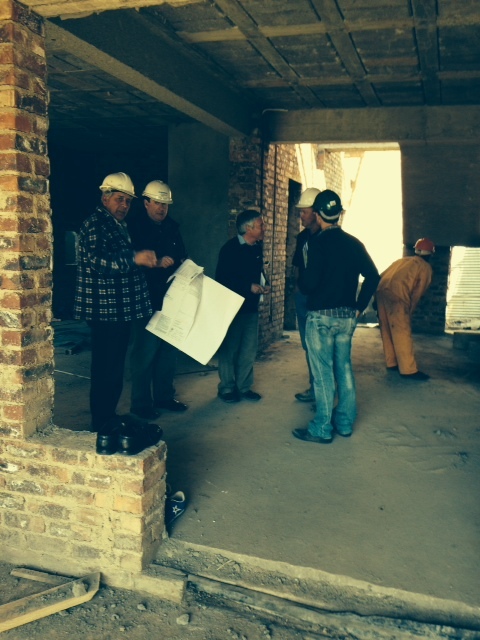 In our new home there will be a ceramic ‘butler’s sink’ in the main part of the kitchen. I will be able to fill the kettle from there and also, if I wish, wash glasses or only slightly used crockery. In the scullery, which will be separated from the main kitchen by a door, I plan to have a far more utilitarian sort of stainless steel kitchen sink with a draining board on either side. 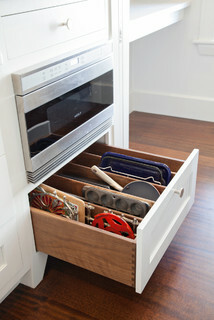 Here I will be able to wash or soak bigger items like pots and pans, the roasting tray, baking trays (cookie trays) etc. The dishwasher will be to one side of the sink. Having a scullery simply means you can get used crockery and cookware out of sight even though you might not have the time to load it into the dishwasher immediately. 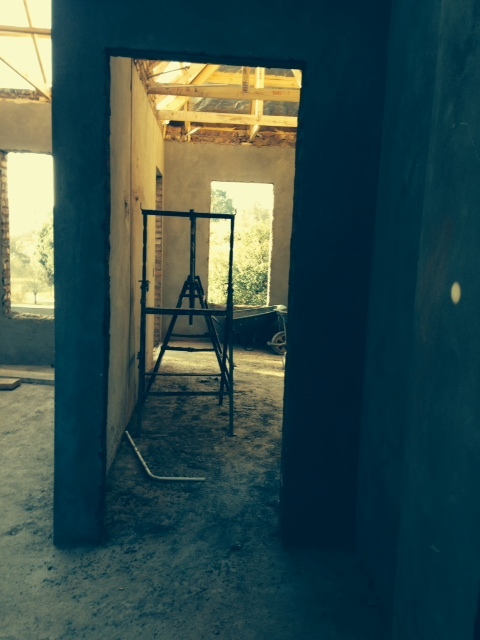 East wall perspective of scullery-to-be. Sink is another confusing one. In South Africa and Britain we use the word ‘sink’ only in kitchens, laundries and sculleries. In bathrooms we use the word ‘basin’. And on the subject of bathrooms, what Americans call the ‘powder room’ we call the ‘guest loo’ or ‘guest toilet.’ Back in the 1970ties when I was an exchange student in Alabama, someone suggested that I pre-shrink new dress fabric in the ‘lavatory’. This led to considerable confusion and not a little embarrassment. The word ‘lavatory’ was even then quite archaic in South Africa and had only ever been used to describe a toilet. I had never heard it in the context of a sink or basin until then and have never heard it used in that context since. Of course it is derived from the Latin, ‘laver’ to wash so perhaps I should have been quicker to make the connection. Other words related to houses which have different meanings are ‘pavement’ which is what we use in place of ‘sidewalk’ and ‘yard’ and ‘hall’. I’m not sure about Australia, but I know that in the States you might refer to your ‘yard’ as being all the property surrounding your house, including garden areas. 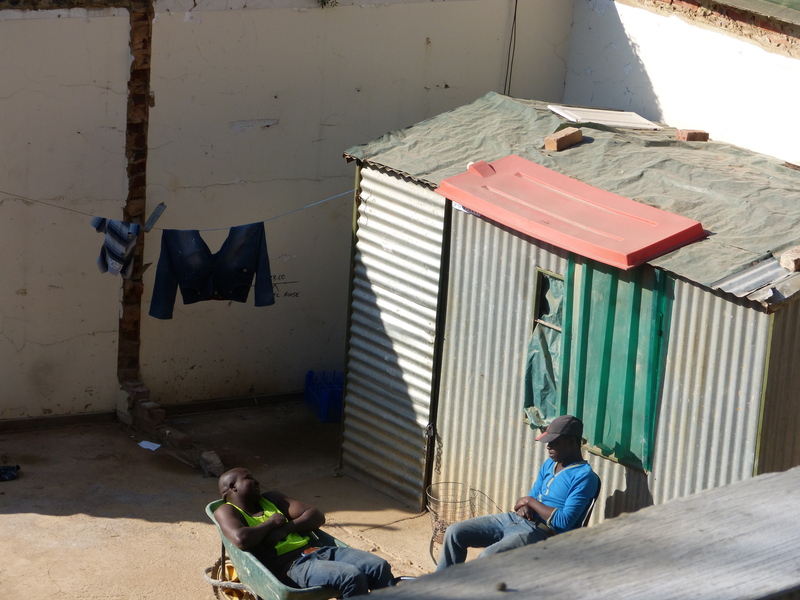 In South Africa a yard is very specifically the space outside your kitchen door where you might keep your refuse bins and where you’re likely to have an outside washing line. 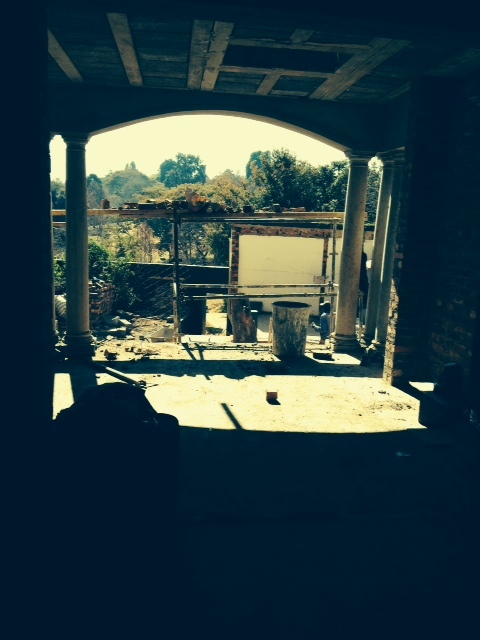 The yard is almost always paved in brick, cement or tiles. The rest of the property is referred to as being the garden, even if there is not much in it. In the States you use the word ‘hall’ for an area we call a ‘passage’. The word ‘hall’ in England and South Africa refers to a large room such as one that is attached to a church for special functions. Our schools all have ‘halls’ for morning assembly, school plays etc. In bigger buildings like schools, we might call passages ‘corridors’ but never halls. In South Africa this would only ever be described as a passage. In South African homes, the ‘hall’ is very specifically the area immediately inside the front door where you might leave your coat, your car keys etc. In other words, it’s the reception area of a private house. 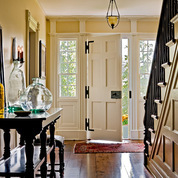 Lovely Entrance Hall found on Houzz. I know in the States it is quite usual for visitors to come in through the back or kitchen door. This is very unusual here where we use our front doors almost all the time. Our back doors are usually out of sight and sometimes inaccessible to visitors since they often open into walled yards. Which brings me to ‘Mud Rooms’. I’m not sure where I first learned about mud rooms. It might have been in British home décor magazines and I have since come across them on all sorts of American decorating sites. I think they are a fabulous idea and would have loved to have had one but space was something of a problem, so I’m going to have to make do with my little laundry leading into the garage instead. 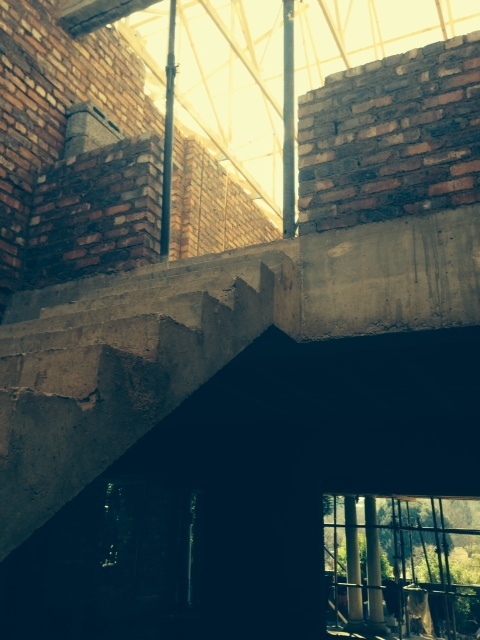 They are creeping into new South African homes, I think, but they’re still a fairly new concept. This is not a country with extremes of climate; we do not often wear Wellington boots and we never need snow gear, but still, there is something awfully appealing to me about this concept. I love this Mudroom found on Houzz. And lastly, for now, I learned something new from Houzz just a few days ago when I looked for photographs of ‘stable doors.’ Our new house is going to have a stable front door. Needless to say, when I looked for stable doors on Houzz, that is exactly what I found, doors opening into stables housing horses….. Somewhere along the line, the words ‘Dutch Doors’ popped up and I realised that what we call ‘stable doors’ here are called ‘Dutch Doors’ in America. 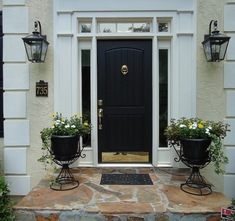 Dutch/Stable door found on Houzz. 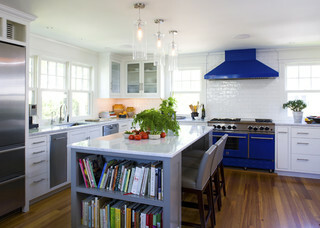 The kitchen above, found on Houzz, is one of the loveliest I’ve ever seen. It combines three elements I have included in our new kitchen; a wooden floor, white units and a bay window. 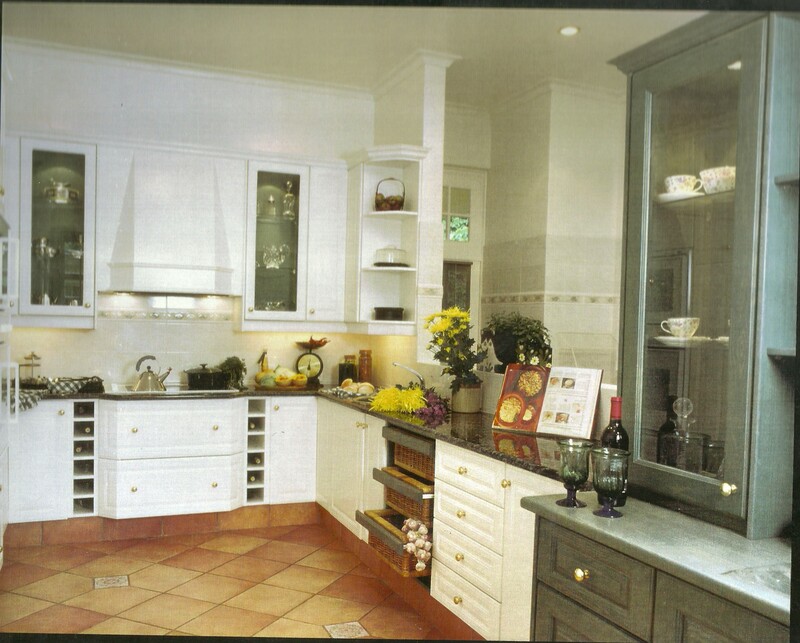 Twenty years ago I more or less designed the kitchen below and I find it quite interesting that I am still drawn to a similar look after all this time. Our kitchen for the past 20 years. Aesthetics have always taken precedence over practicality for me (I wouldn’t have made a good Engineer…) and although I got the basic ‘triangle’ right, there would be a few design changes I would make now, although the overall feel and appearance of the room worked for me then and still does. I did make one change about 5 years ago and that was to knock a hole in the north-facing wall which separated the kitchen from the family room. 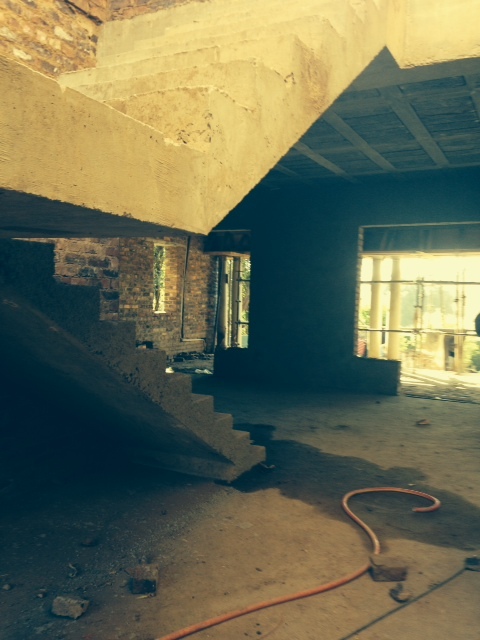 Hole knocked through to open kitchen up to the family room and garden. 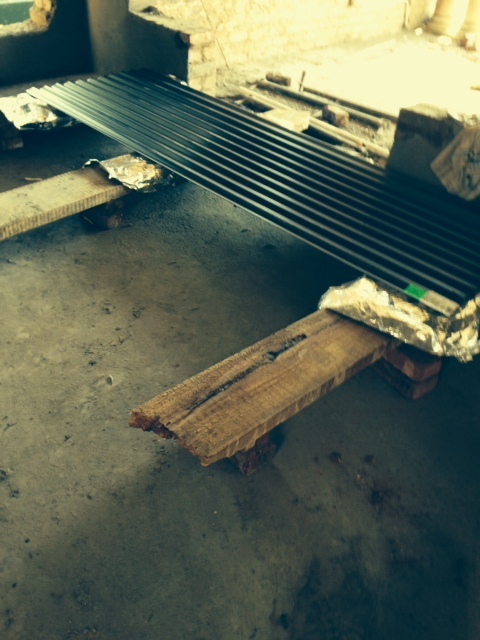 Fortunately we were able to match the granite top and could construct a new, wide countertop. It destroyed the symmetry which had been a feature of the kitchen and I did lose some cupboard space and had to install a much smaller oven, which has sometimes been a hindrance. But the few disadvantages have been far outweighed by the advantages of being able to be part of the family room conversations, being able to keep up with rugby matches and Wimbledon from my position in front of the hob and having a view across the patio to the end of the garden. I’ve loved it and would never choose to go back to an entirely separate, closed-off kitchen. 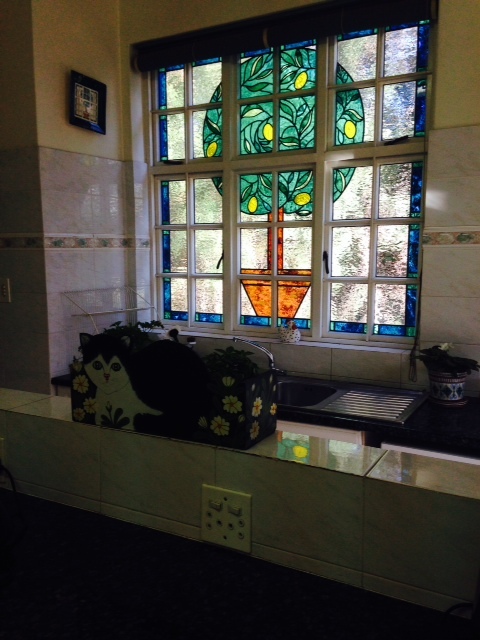 Stained Glass window in my present kitchen. Something I’ll be sad to leave behind. There are two aspects of my present kitchen that I wanted to change in the new one. The first was to have a completely separate scullery section which is a help when you have one open-plan living space, and the second was to have direct access from the garage into the kitchen and we’ve managed to achieve this. A door leads from the garage into a small laundry area which in turn leads into the scullery. Good for stormy Highveld summers and for carrying in the groceries. So, for quite a few months now, behind the scenes of the house-build, I’ve been discussing the kitchen design with Adri from Acube Designs who came highly recommended by Bernard, our architect. Fortunately I took an instant liking to Adri and when I met Caspar, of Woodpecker Creations, I took an instant liking to him too. It makes everything a whole lot easier. Adri and Caspar confirming measurements. Although I had a pretty good idea of the sort of look I wanted to achieve, I also spent a lot of time browsing through various sites on Houzz and I took some inspiration from several photographs I saw there. Friends made various suggestions too; one being that I should consider ‘two’ kitchens, a ‘front’ open plan one where all the finished products can be set out beautifully and a ‘back’ one where all the heavy-duty work goes on. The other suggestion was that I should have two dishwashers, side by side. While the idea of two kitchens might be appealing, I have tried to keep very conscious of the fact that the biggest motivation to build this house was to Downsize and Simplify and that also applies to the sort of entertaining I expect to do. Our present home has a separate, formal dining room and while I really enjoyed having that dedicated space when we moved here, over the past several years I have felt the need of it less and less as our way of eating and style of hosting friends has become more and more casual. The brief we gave Bernard for the new house, was to have one comfortable open-plan living area that included the kitchen. I intend shrinking our antique dining room table down to its smallest size and using it in the library area as a writing and jigsaw puzzle surface. 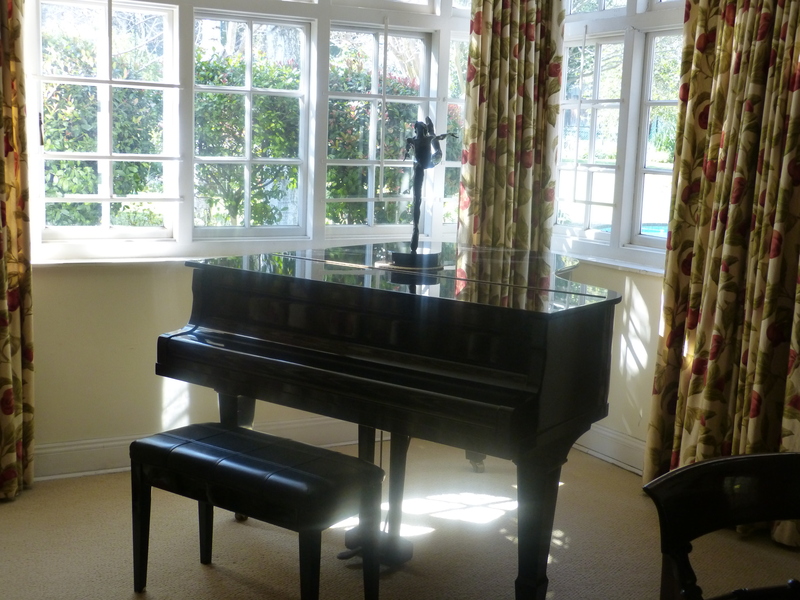 Piano in the dining room will have to go into storage. 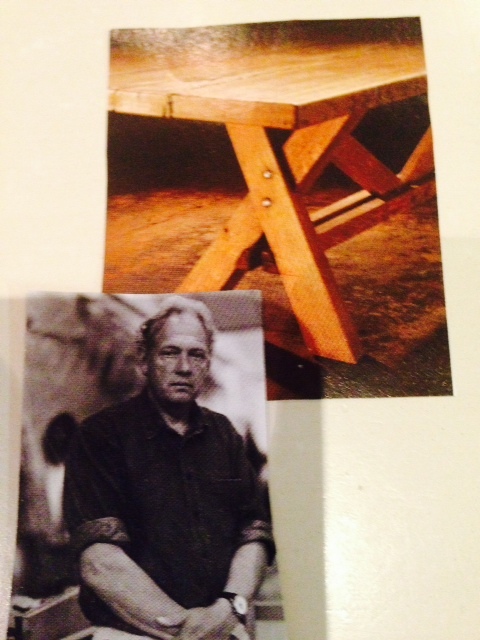 A few years ago I became aware of a South African furniture designer and manufacturer called Pierre Cronje. A lot of his designs refer back to old Cape furniture designs and are slightly rugged without being rough. 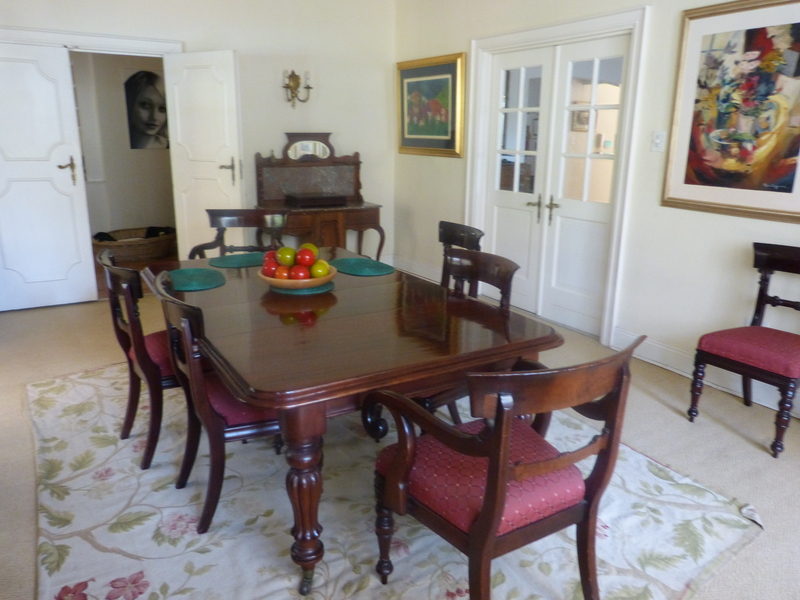 I love his style and have chosen one of his tables to take the place of the old mahogany one. I have been out to his Johannesburg showroom twice in the last week. I could make a habit of it. So the new house will not have a dining room as such, but only a table dividing the seating area from the kitchen. I can see it clearly in my head and I just hope it will turn out in the way I envisage it. Once again, in the photo above, I like the combination of the wooden floors and white units. We have also included bookshelves in the island in the new kitchen. The two photographs below, both from Houzz, got me really excited and I have asked Adri and Caspar to include two similar drawers in our new kitchen. 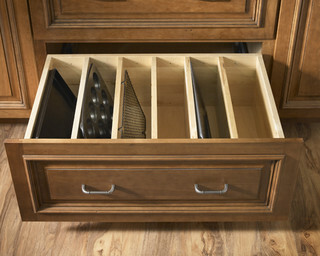 Although it looks like such an obvious solution for baking trays, I have never seen drawers divided vertically like this before and as baking is one of my hobbies, I am used to the chaos and cacophony of pots and pans toppling over and sometimes disappearing over the back of the drawer, while I struggle to extract the particular cookie tray or muffin pan I need which is invariably underneath everything else. 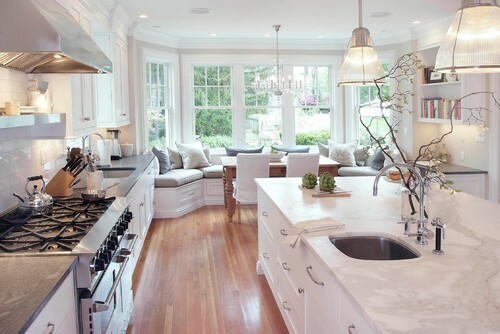 Below is another beautiful white kitchen and I love the light fittings over the island. I haven’t settled on ‘island lights’ yet. In an open plan living space I am cautious about too many hanging fittings, much as I find these really appealing. I might start off with only down-lights – also visible in this photograph – and make up my mind about pendants when we’ve lived in the space for a while. Something else I like about the kitchen below are the high, glass-fronted cupboards. They are useful for taking up space between the tops of the ordinary cupboards and the ceiling and great for displaying crockery or silver that is seldom used. I’ve borrowed this idea too. Below are more white cabinets on wooden floors. And more high, glass-fronted cupboards. There will be similar handles on our cupboards. 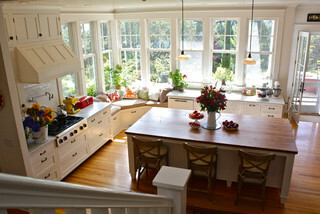 And below, just for fun, is another gorgeous kitchen with a bay window. 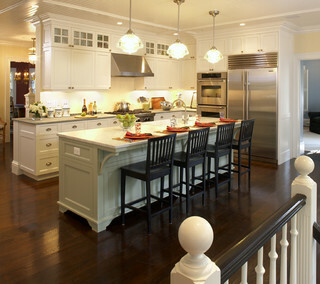 I think I might be addicted to kitchens on Houzz. Close-up of the lovely bay window. For now, I plan to put a small couch in our bay window as I think it might be more versatile, and definitely more comfortable on sunny afternoons, but I might still fall prey to the seduction of a built-in window seat. 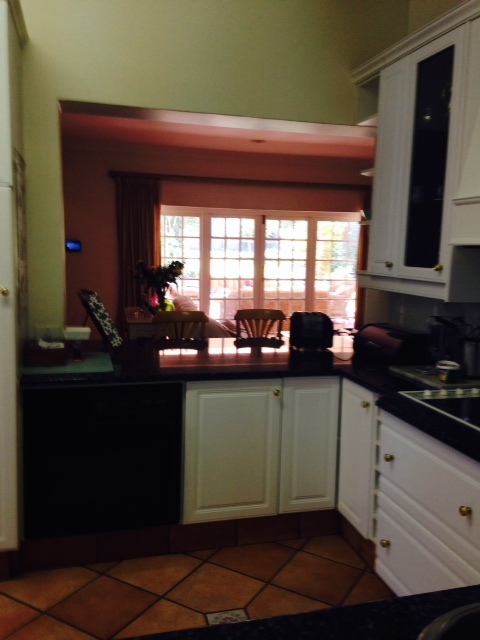 And finally, in the modern kitchen below, I like the windows between the lower cupboards and the upper ones. 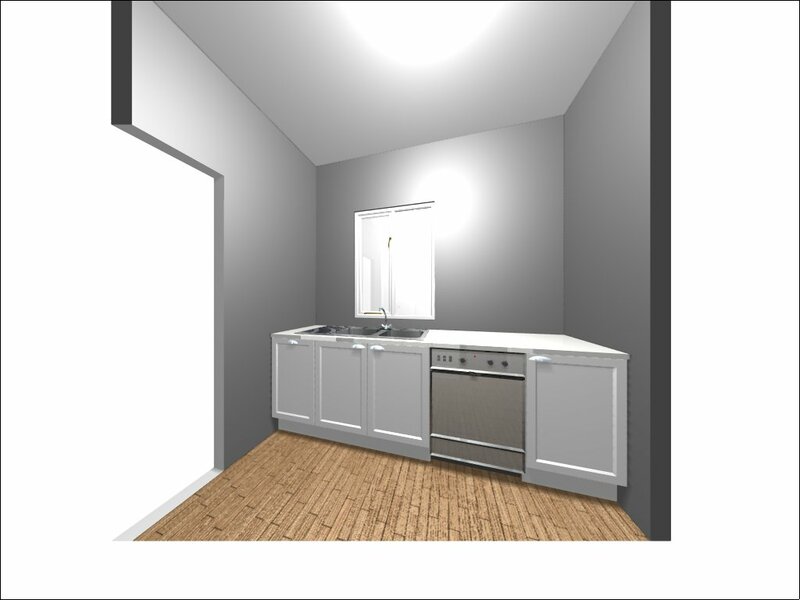 We’re going to have three, small opening windows between the lower and upper cupboards. The boundary garden wall is very close to the windows and I’m planning to hang planters or trellises on it. 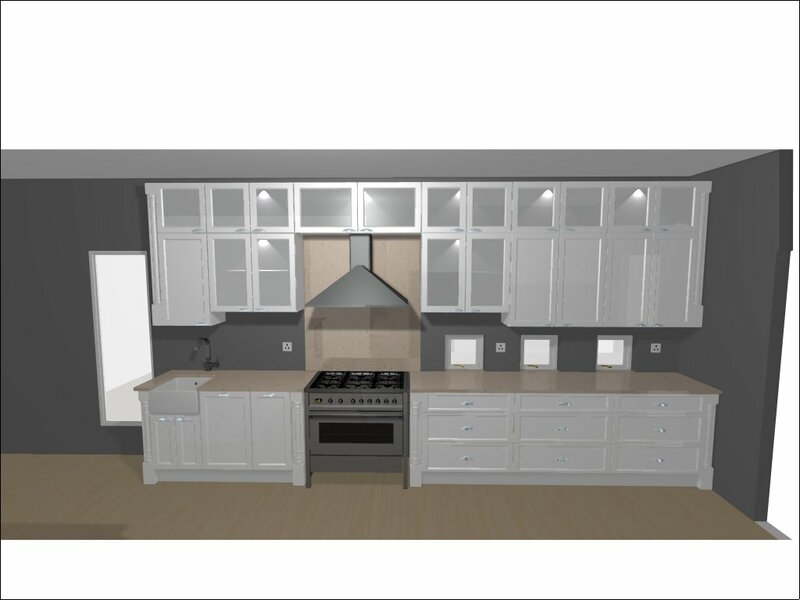 Below are three diagrams of the new kitchen. 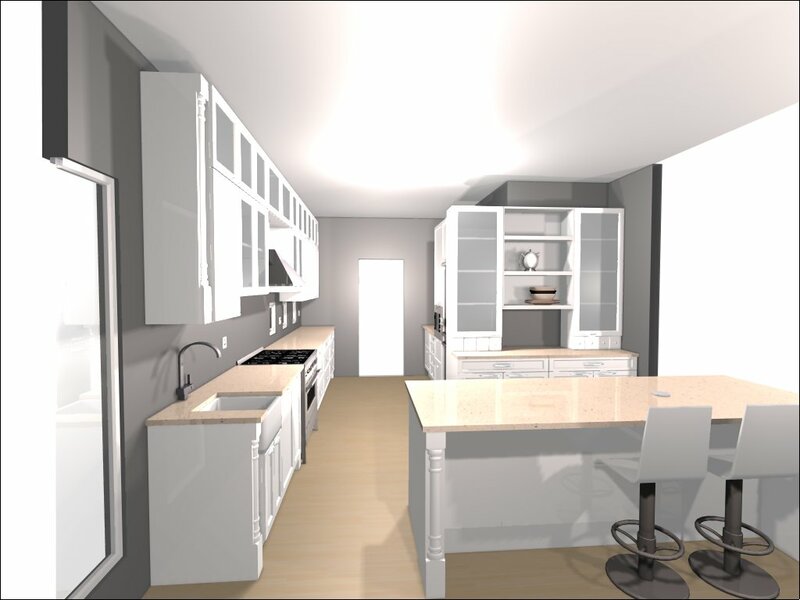 Not all the finishing details are shown in these renderings but you can get a general idea. Diagram of the new kitchen, from North to South. In the picture above, you can see the door leading to the scullery. East wall of the kitchen. In the drawing above, you can see the long, narrow window on the left and the 3 small windows between the lower and upper cupboards. The long window is in line with the kitchen island from the north/south diagram. 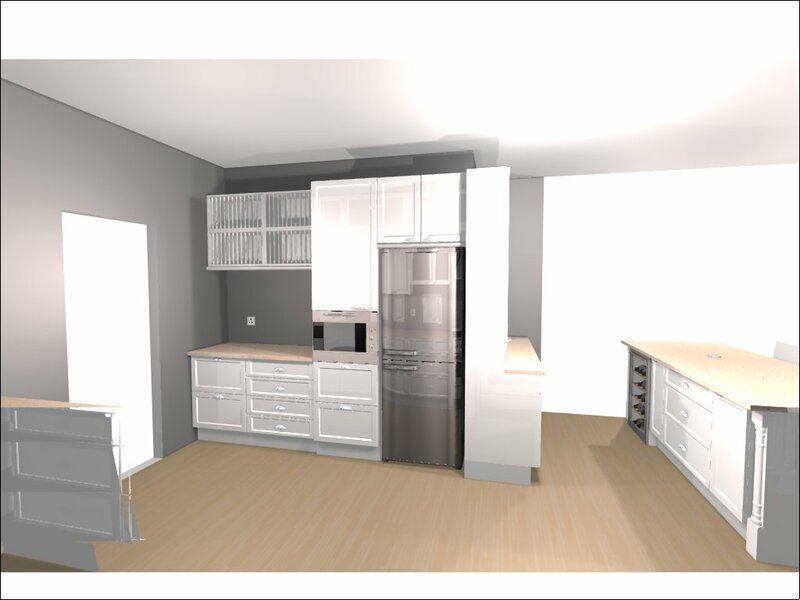 The cupboards have ‘Shaker panel’ doors with cup handles and will be Ivory White in colour. Now we can only wait and see. Tags Building from scratch. Kitchens. The roof sheeting is finally going on! The double sprockets, which you can see under the eaves above and in the photograph below, were Bernard’s suggestion and I think they look great. A few of the workmen are living on the site now because of the time it takes them to commute from their homes on a daily basis. I ‘m not entirely comfortable with this. 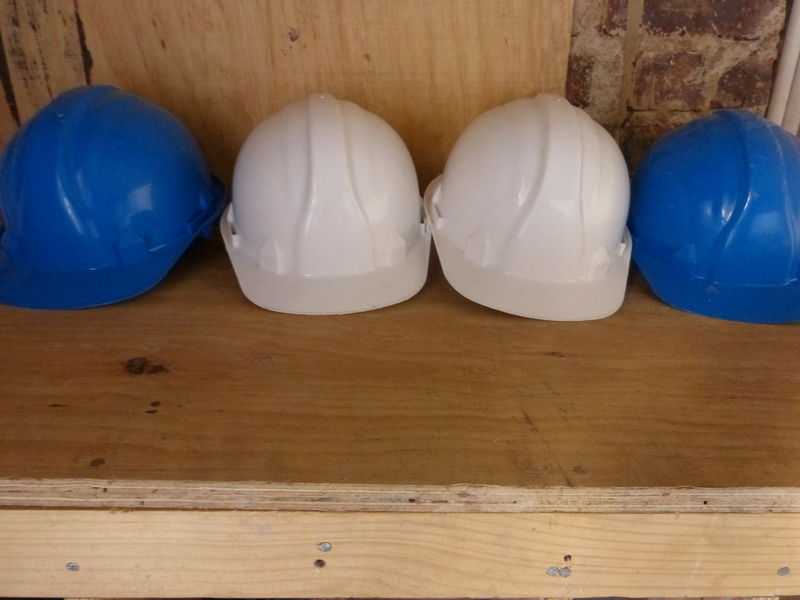 It’s difficult to accept that their living conditions at home could be such that they are prepared to ‘camp’ on a building site in mid-winter for the sake of saving on travel time – which is the reason given. 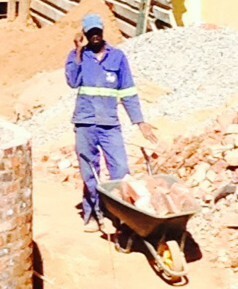 A wheelbarrow, as shown above, is a many-splendoured thing. July view from main bedroom. 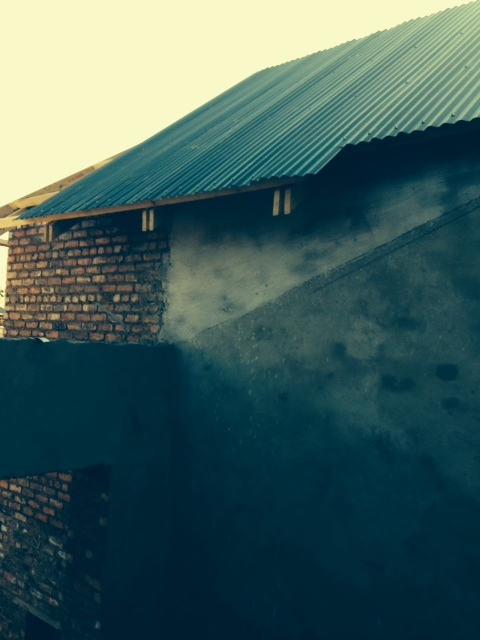 We are still debating how to ‘finish’ the gaps in the upstairs balcony wall as seen above. 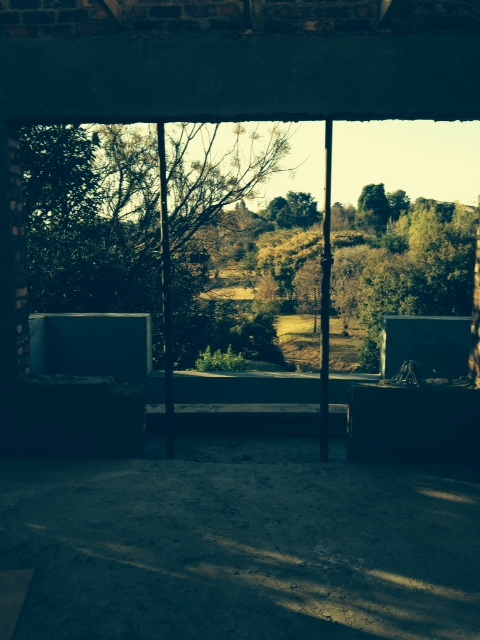 We want the ‘cut-out’ sections for the view they provide but will have to put in either railings or glass panels. The Jury is still out. Looking from Bedroom 3 through Bedroom 2. The photo above was taken from the doorway into the third and smallest bedroom, down the short passage (hall) into the second bedroom. There is a walk-in linen cupboard off to the right and the room glimpsed on the left is the pyjama lounge. And suddenly there was this lovely surprise…. 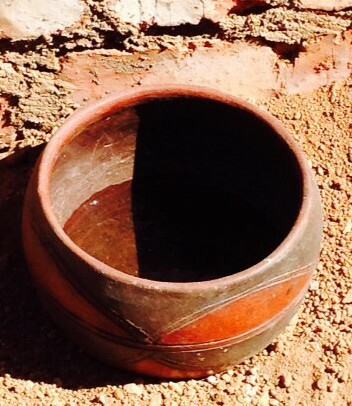 a traditional African pottery bowl. I’m guessing someone’s mother or wife sent a meal in it. It was there one day and gone the next. Here are some photographs taken today. 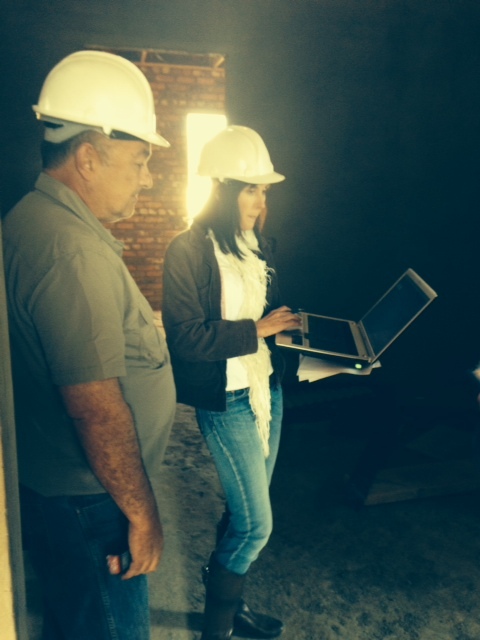 We met with two potential swimming pool contractors and Bernard also met with a security consultant to discuss the possibility of installing a roll-down security shutter that will be used to ‘lock off’ the upstairs part of the house at night. Keeping the upstairs area of a home locked off from the downstairs at night has become something of a norm in this country. This is why many new houses now have an upstairs ‘pyjama lounge’ which is basically a tv/family room where a family can gather late at night even if the rest of the house is ‘alarmed.’ As I write this, I realise it might sound a bit extreme to some people, but this sort of thinking comes completely naturally to us now. Street view taken at an angle through a neighbour’s electric fencing. In the photo above you can see that there is still a lot of activity happening on the roof. The roof sheeting was delivered this morning. This was much sooner than we expected but our metal workers’ union, NUMSA, started a major strike yesterday. The roofing people, with whom we’re very impressed, actually had the foresight to deliver the sheeting today as they suspect there will be huge interruptions to their schedule soon. 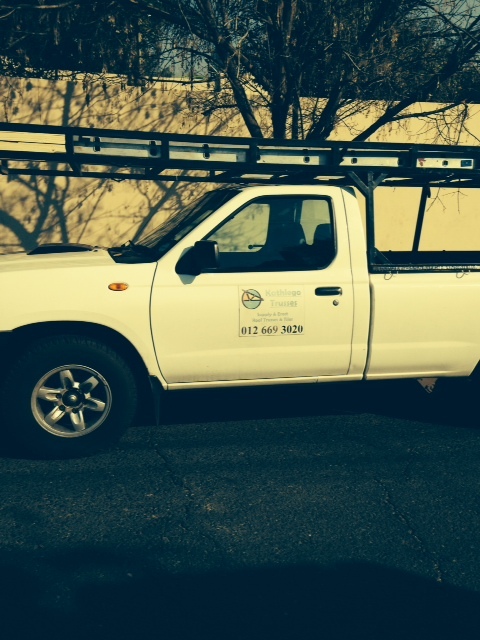 It’s unusual for contractors like this to be so proactive. We think these guys are great. 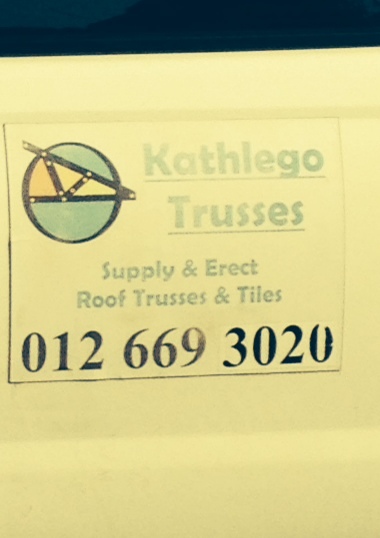 Kathlego Trusses – Thinking Ahead. I think it’s been a while since I mentioned the roof. We have chosen to have an iron roof – traditionally used for farm houses in the past – and have selected a dark grey called Dolphin Grey. The lighter shades of grey looked almost white in our bright sunshine. All the colours we considered vary a lot depending on how light strikes them at any given time. I’m looking forward to hearing our summer rains beating on these sheets. The Staircase taken from the front door. We wanted the sense of space given by positioning the stairs this way; ie with the lower half flight away from the front door. It means that the higher flight is ‘free floating’ in that it will need bannisters on both sides. I’m giving this a lot of thought at the moment along with how I’m going to ‘furnish’ the area below the stairs. For a while I wondered if my daughter’s baby grand piano would fit but I think it will be a bit cramped. Until the floors are in and the painting done, it is proving to be quite challenging for me to envisage just how this space will work. 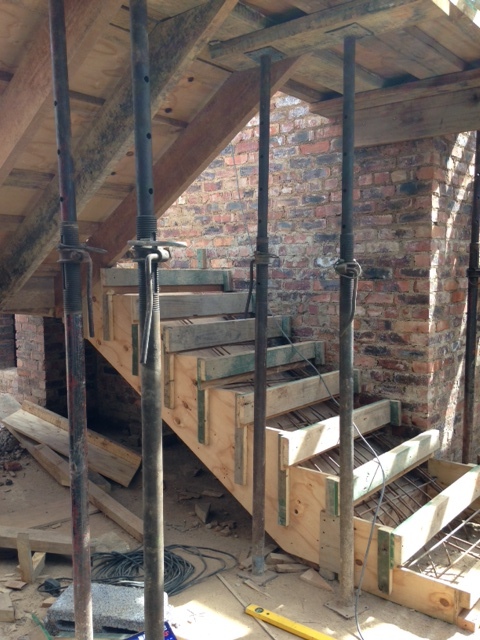 The upper flight of stairs opens directly onto the landing/pyjama lounge which faces out over the park. 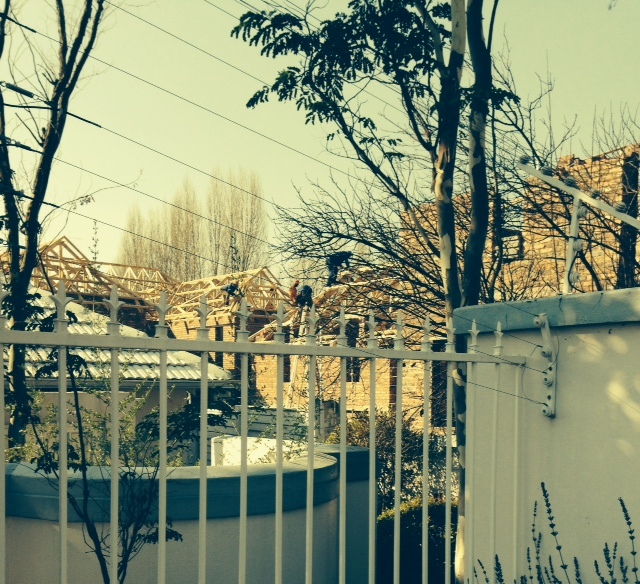 The walls which you can see in place now are at a height demanded by safety and security laws. I am still debating lowering them and putting a railing across their top or a glass panel. It is behind these walls that a security shutter will be lowered at night. “Archive” photo of stairs from another angle. It much easier now to get an idea of what the covered patio is going to be like. It is a lovely big space and I think we’ll probably use it more than the indoor living area. 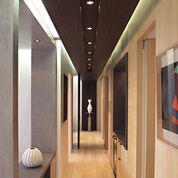 In the picture below you can see a ‘square’ marked off in the ceiling. 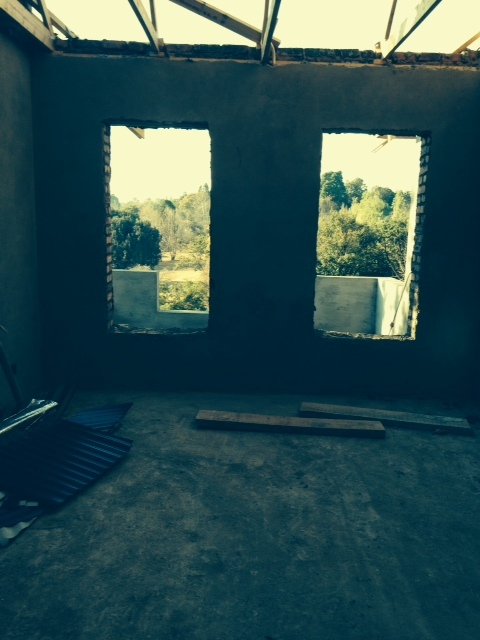 This is where a skylight will eventually be installed. Bernard was funny when we saw the arched openings for the first time. 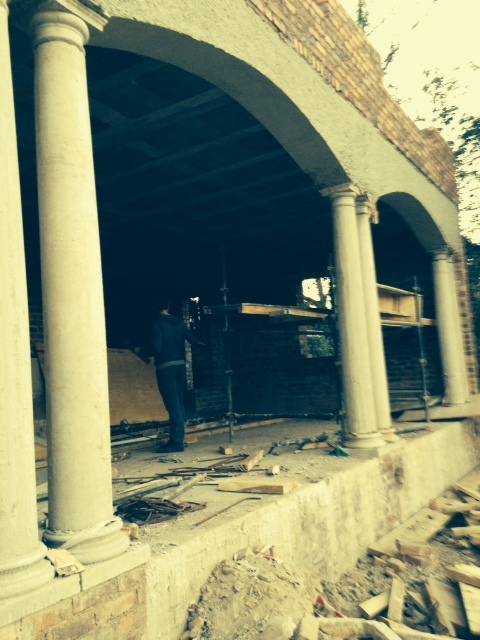 ‘They look good’, he said, ‘I don’t usually do arches…’ ‘Then why did you agree to have them here? ?’ ‘Because the house needed them.’ – his response… And I think he’s right. The house did need them and I think they frame the view rather well. In the elevation which I am posting again below, you can see the design of the patio quite clearly. It is satisfying to see it taking form now. 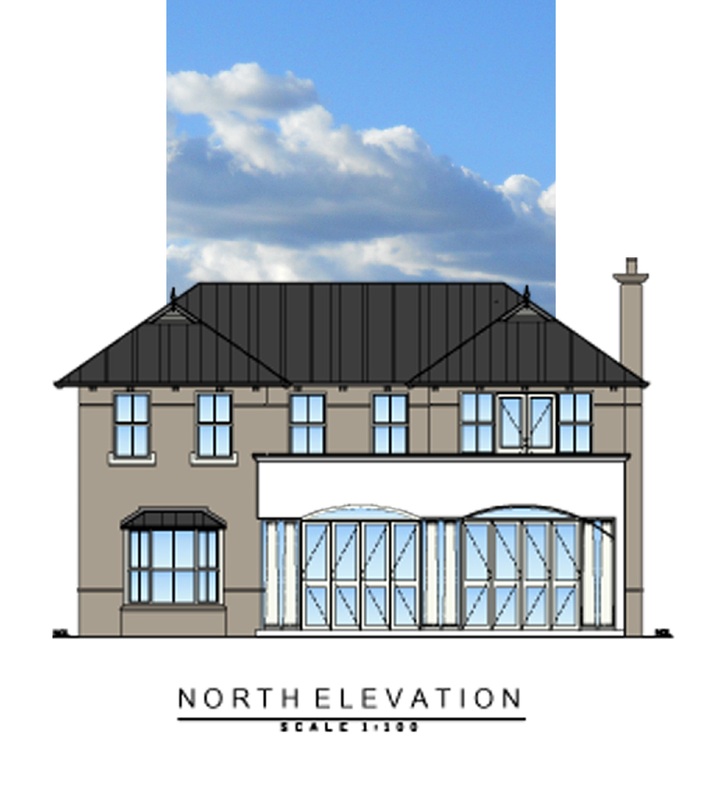 The North Elevation is now becoming a reality. 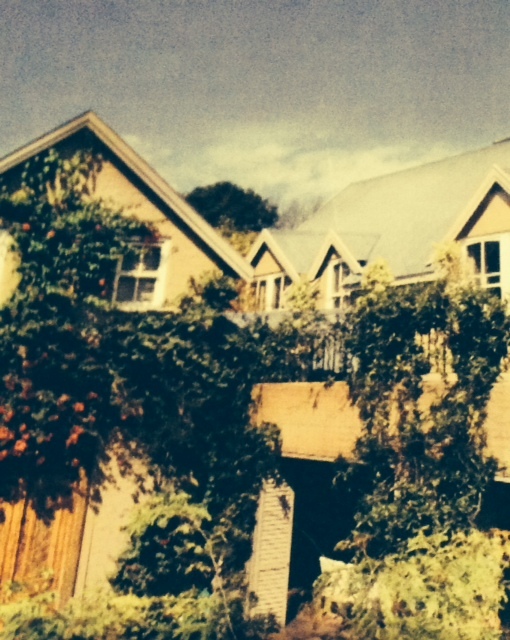 Below is a picture of a ‘contemporary farm house’ under an iron roof similar to the one we’ll be having. Contemporary Farmhouse with iron roof from which I drew some inspiration. Tags Building from scratch. Parkhurst. 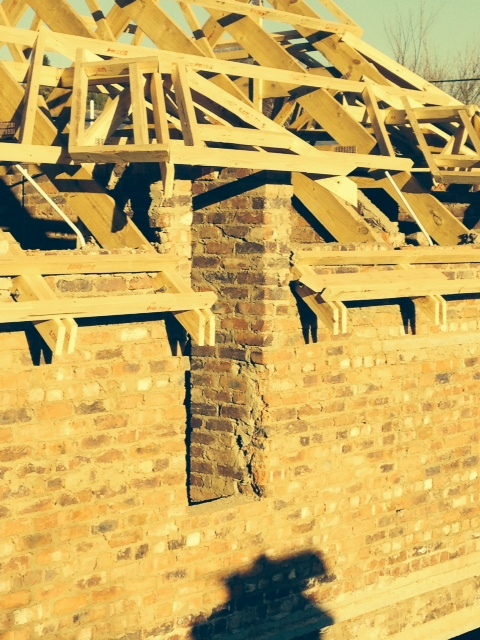 Roof Trusses.